The Japanese automotive sector recorded a 5.2% year-on-year sales increase in 2017, while production rose 5.3%, to 9.6 million units, due to higher domestic sales (mainly driven by new model launches) and increased exports (up 1.5%) to key markets such as the US and Europe. 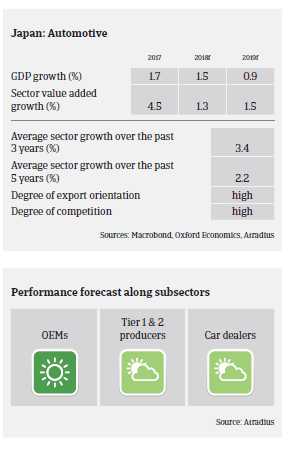 Profitability in the Japanese automotive sector is high, and over the past five years the average net profit margin of Japan’s top three automakers (Toyota Motors, Nissan Motors and Honda Motors) was 6.2% - higher than their large foreign rivals. This is mainly due to streamlining at various stages from design to production. Due to the good business performance, banks are generally willing to provide loans with good financing conditions, which is helped by low interest rates. The average payment duration in the Japanese automotive industry is around 30 days for car retailers, 30-60 days for manufacturers and 60-90 days for wholesalers. Payment behaviour in this sector has been very good over the past two years. The number of non-payments and insolvency cases is very low, and it is expected that there will be no deterioration in the coming months, given that the business environment remains stable. However, there are major challenges ahead. Japanese automotive manufacturers active in the US are affected by the import tariffs on steel and aluminium imposed since June 2017. There are downside risks for the industry stemming from an escalation of the US-China trade dispute. China is Japan’s biggest export destination, and any trade restrictions weakening Chinese purchasing power would curb demand for Japanese products, including cars. In the domestic market demand could be curbed by an increase in the consumption tax planned for October 2019. Due to the generally positive indicators, we currently assess the credit risk and business performance of the automotive sector as “Good”, and our underwriting stance continues to be very open for large manufacturers and open for car parts suppliers and wholesalers. However, we have adopted a more cautious approach for smaller businesses, which often have weaker financials and are more vulnerable to sudden changes in market sentiment. We also monitor any effects punitive tariffs and an escalation of trade disputes could have on the sales and profit performance of larger manufacturers.